Bring the rice, water, 1 teaspoon turmeric and a teaspoon of salt to a simmer, cover and cook on low for twenty minutes or until all the liquid is absorbed. Fluff the rice with a fork, taste for salt and pepper as well as turmeric. I have found that turmeric can create a bitter taste if used too aggresively, so add any additional in small amounts and taste between. Don't go for a dark yellow colored rice - that would undoubtably be too much! Pale golden color is the way to go. If you are using pork in the dish, stir it into the cooked rice. This is a way my mother used leftover pork shoulder roast, and I like to use a grilled lean pork chop. Combine the onion, peppers, garlic, water and beans while the rice is cooking, bring to a boil and then simmer until the rice is done (about twenty minutes). Taste for salt and pepper. If using canned beans, you can drain and rinse them to control the amount of sodium in the dish since some brands can contain A LOT! Otherwise adding the canned liquid is fine. If the mixture seems too thin, simmer longer, if it seems too thick, add a bit more water. It will naturally vary according to the size of the onion and peppers you use, but it should have just enough liquid to barely cover the mix. Either put the rice on one large platter and add the bean mixture on top with a generous sprinkle of capers, or make seperate plates stovetop and let people add the capers as they like. Any kind of caper adds the finishing touch to this, but I like the large ones since the smaller ones seem to get just a bit lost, and I end up using many more! 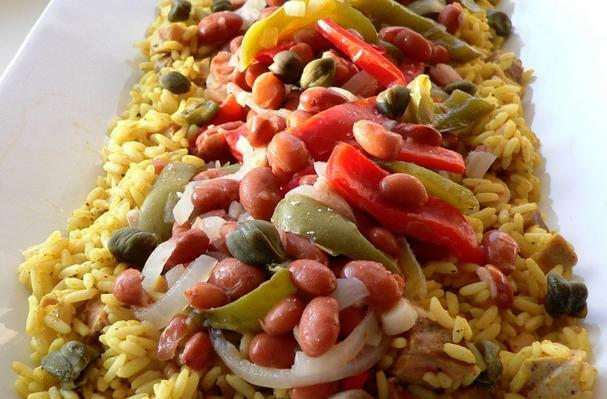 A perfect protein made by the combination of the rice and beans, plus fresh onion, sweet bell peppers.......add to that the flavor from plump capers and turmeric and it creates an extraordinary dish. Family lore has it that my mother learned this recipe when my father was stationed in Puerto Rico with the Army in the 50's, but it's true country-of-origin is a mystery. What I know for certain is that it is an all time family favorite - and the kind of dish I still love. Simple ingredients combined to create an amazing meal, and when it is as economical and healthy as this one, well - so much the better. We always add a little lean pork, which is great, but without it, it is a tasty vegetarian main course. Because this has been such an important recipe in my family for so very long, I've made many efforts over the past decades to find a reference to it in countless cookbooks, and then on the Internet. I have yet to find it, even in a different variation, and that makes me all the more eager to share it (because it is delicious), as well as take the opportunity as a food blogger to reach out and ask...."Do you know this dish? Are you familiar with this particular combination of ingredients? Please let me know !